When Apple introduced the 2016 generation of its MacBooks the new machines were criticized for the lack of an SD-card reader and a generally reduced number of ports. OWC’s Thunderbolt 3 Dock looks like an interesting solution for anyone who owns a new MacBook or any other computer with a limited number of ports and connectors. The OWC Thunderbolt 3 Dock can now be pre-ordered at a number of authorized resellers and shipping is scheduled for February 2017. When preordered the OWC Thunderbolt 3 Dock is priced at $279 and comes with a free 0.5 meter Thunderbolt 3 40Gb/s USB-C cable. The regular retail price will be $300. WOODSTOCK, IL – November 3, 2016 – OWC®, a leading zero emissions Mac and PC technology company, today introduced the all-new Thunderbolt 3 Dock – the latest in its award-winning lineup of connectivity expansion solutions. 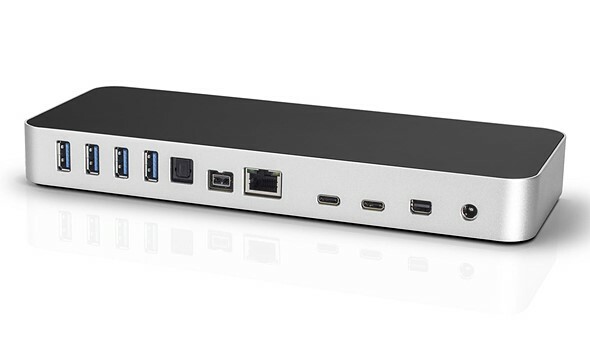 Now available for pre-order, the Thunderbolt 3 Dock offers exceptional flexibility and connectivity with 13 ports, up to 40Gb/s of bandwidth, and the capability to power the new 2016 MacBook Pro, all in an elegant, industrial design. For anyone concerned with the limited port options on new Thunderbolt 3-equipped Macs or PCs, the Thunderbolt 3 Dock is the ideal solution for connecting a wide variety of existing and future devices including external hard drives, webcams, audio interfaces, Ultra HD displays, wired networks, and more. ALL YOUR DEVICES. INCREDIBLE PERFORMANCE. ONE CABLE. At twice the bandwidth of Thunderbolt 2, the Thunderbolt 3 Dock takes full advantage of the cutting-edge performance of Thunderbolt 3 technology with throughput up to 40Gb/s. As a result, the new Thunderbolt 3 Dock offers more ports than ever, including 13 ports of connectivity and the capability to charge mobile devices, connect multiple 4K displays, add external storage (including legacy devices like FireWire drives), import photos and videos from SD cards, access wired networks via Gigabit Ethernet, connect audio accessories, and even power the new 2016 MacBook Pro – all through a single Thunderbolt 3 cable. The OWC Thunderbolt 3 Dock is currently available for pre-order at MacSales.com and other authorized resellers. Deliveries of the dock will begin in February 2017. The OWC Thunderbolt 3 Dock is priced at $279.00 during the pre-order event. Plus, it ships with a free .5 meter Thunderbolt 3 40Gb/s USB-C cable–valued at $24.95. OWC has a history of creating full-featured connectivity solutions for Mac users around the world. In addition to the upcoming Thunderbolt 3 Dock, OWC offers the award-winning Thunderbolt 2 and USB-C Docks. 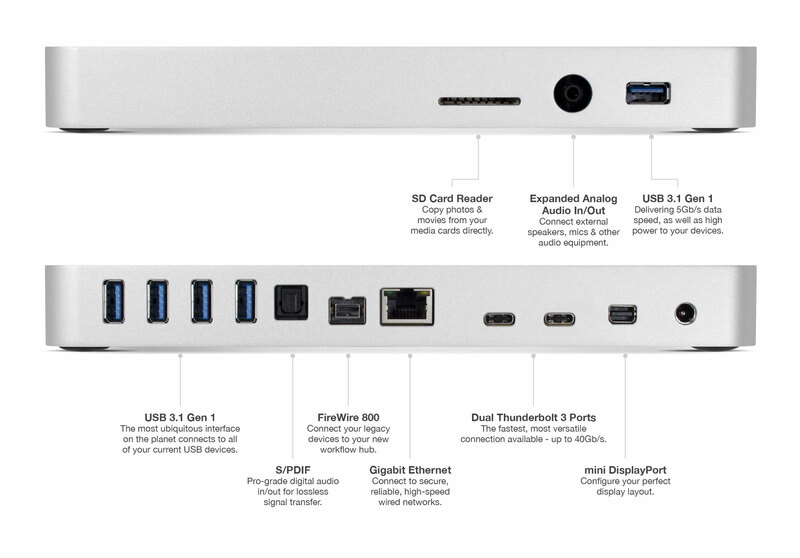 The OWC Thunderbolt 2 Dock provides 12 ports of connectivity all united with just a single Thunderbolt 2 cable, while the OWC USB-C Dock provides a complete connectivity solution for computers that utilize USB-C ports. NEED IMMEDIATE CONNECTIVITY FOR YOUR 2016 MACBOOK PRO? If you need an immediate connectivity solution, the OWC USB-C Dock and OWC Thunderbolt 2 Dock are currently shipping and fully compatible with the new 2016 MacBook Pro. Simply connect the OWC Thunderbolt 2 Dock via a Thunderbolt 3-to-Thunderbolt 2 adapter (sold separately) or directly connect the OWC USB-C Dock to your 2016 MacBook Pro, or MacBook, and bring a new world of connectivity to your workflow.